Mamma Mia! Will full-scale pizza drone delivery services be the next big thing? This past August, pizza powerhouse Domino’s made history by announcing it was trialling pizza deliveries via drone in New Zealand. Check out the video of the successful delivery here. Experimentation with drone deliveries is nothing new for Domino’s. In 2013 they did a promotional stunt in the UK (video link: YouTube) and just this past June they did something similar in Greece (video link: YouTube) while also showcasing a prototype of their future “zero click ordering” app with a 10-second countdown. This time around however, Domino’s has partnered up with Flirtey, the company who this past year alone has trialled drone delivery of medical supplies as well as drone delivery of 7-Eleven goodies such as coffee, donuts, a chicken sandwich and a Slurpee. This partnership is part of Domino’s long-term strategy to automate delivery alongside the company’s future fleet of 190 kg (419 lb) Domino’s Robotic Units (aka DRUs) which are the company’s (potentially solar powered) commercial autonomous delivery vehicles ready to deliver up to 10 hot pizza pies within a 20 km (12.4 mile) radius of their home franchise base. Is Domino’s the first to come up with this concept of flying pizzas? But they are most likely the first to be able to make it happen at a commercial level. University students and their supervisor in Berlin work on devouring the first pizza successfully delivered via drone back in 2012. Domino’s Domicopter in action in the UK. You can see the DomiCopter delivering a two pepperoni pizza pie payload here. Pizza drone point-of-view of Mumbai, India. Francesco’s pizza drone in flight. Dodo Pizza delivery drone preparing for takeoff. Dodo Pizza in Syktyvkar claims it was them who made the first real commercial pizza drone delivery as they actually received money (3,600 rubles or approximately US$ 100) for their pizza orders. Their customized drone with dropdown doors and a rope mechanism to lower the hot cargo was created in partnership with Russian start-up Copter Express. Their drone was designed to deliver up to 5 pizza pies each weighing 1 kg (2.2 lbs). According to the FAQ on their YouTube channel, deliveries were made to a city park where employees were actively selling their product using tablets to take down orders. Non-believing customers not only got dinner but also a show! Delivery mechanism of Dodo Pizza delivery drone. Action shot of the Dodo Pizza and CopterExpress delivery drone. Authorities however were not so pleased. Although no specific law existed, Dodo Pizza was fined 50,000 rubles (US$1,500) and was warned by city officials under the threat that the next punishment would be much more severe. An alternative video of the Dodo Pizza drone in action was recorded for a Japanese TV channel and can be found here >>> YouTube. 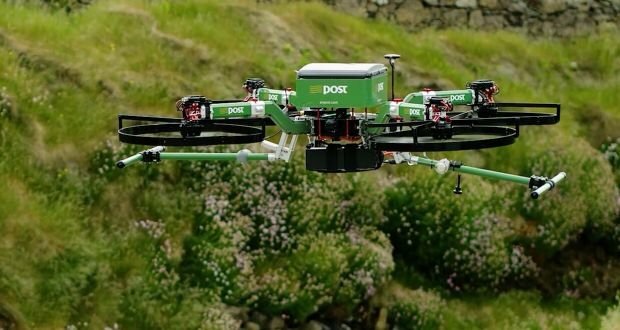 Although no longer conducting drone deliveries, Dodo Pizza is doing well, with 70 locations in Russia and new plans to open 400 outlets in the USA over the next 10 years. Pizza delivery drone in Brooklyn. A Brooklyn-based pizzeria also tested pizza drone deliveries. Although it all started as a publicity stunt (flying from the roof of the owner’s apartment complex to a neighbor’s backyard) apparently you can still order the Williamsburg Pizza Drone Base Delivery package for US$ 59. According to their website, the package includes one large pizza pie as well as a digital video to commemorate the occasion. A video of pizza drone in action can be seen in this New York Post article. Vero Verde pizza drone pre-flight. Vero Verde pizza drone in flight in Brazil. Apparently the whole pizza drone reached a peak in 2014. In December of that year, Vero Verde Pizza in Sao Paulo also released a promotional video showcasing a quadcopter covering 1.5 km (1 mile) at a speed of 40 km/h (25 mph). You can see the drone in action here >>> YouTube. Domino’s + Flirtey’s pizza delivery drone. Getting back to 2016, there are still some hurdles and challenges that need to be overcome before drones start asking you for tips. Battery power and the resulting limited range before needing to recharge are the biggest hurdles for today’s drones. It is one of the reasons why current parcel drones have limited payload capacity. Two things that will work in Domino’s favor though is a) the fact that in Auckland they only sell pizza pies in one size (thus simplifying container logistics) and b) their drone is expected to be able to carry up to 5.5 kg (12.1 lbs) or 5 pizza pies. Pizza drone delivery gone wrong, Breaking Bad style. The 800 pound gorilla in the room though is the problem of government regulations. Current U.S. FAA rules are pretty restrictive when it comes to flying drones commercially. Even in drone-friendly New Zealand, a drone is not allowed to fly further than its operator’s line of sight so human operators (aka tech savvy delivery boys) will still be needed. Nevertheless, the first test deliveries to actual Kiwi customers are slated for September 26 with plans (if successful) to expand the use of DRU drones to Australia, Belgium, France, Germany, Japan, and the Netherlands. As Pizza Hut in New Zealand has learned, Domino’s is certainly on the war path to dominate the cut-throat fast food battle by embracing drone technology as the next big thing in pizza delivery. So what do you think? Would you order your pizza by drone?